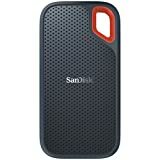 The good thing about the SanDisk 500GB Extreme Portable External SSD is that it’s compact and lightning fast, with support for transfer speeds of up to a whopping 550Mbps. But the downside is that you have to pay a pretty penny for all that speed — the retail price on this model is $170. Amazon is running a sale right now though, and it slashes the price all the way down to $89.99. That’s the best price we’ve seen, and we doubt it’ll last very long.